Anyone who’s ever tried finding a healthier, dairy-free replacement for melt-in-your-mouth peanut butter cups knows the struggle is real. While there are a few quality contenders on store shelves—looking at you, Justin’s, Theo, and UnReal—nothing has ever truly hit the spot for me—aka Reese’s number one fan before going vegan. That is until I combined a few staples I had lying around my apartment when my sweet tooth struck. 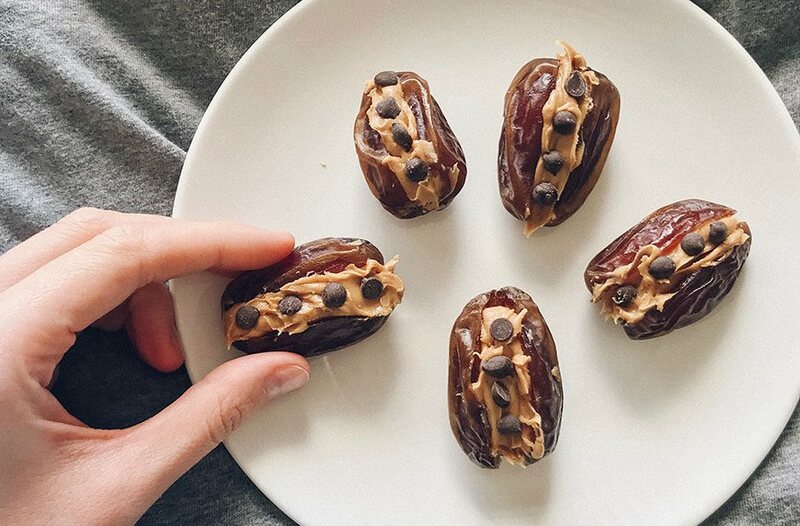 It turns out all you need to create a healthier version of the childhood favorite is three simple ingredients: Medjool dates, peanut butter, and dark chocolate chips. After de-pitting the dates with a knife, simply fill them with a big glob of your favorite smooth peanut butter and top them with those chocolatey morsels (I used Enjoy Life’s Semi-Sweet Mini Chips). Honestly, I didn’t know what to expect when I took my first bite…but I think my eyes got the widest they’ve ever been as I experienced the kind of bliss only a combo of chocolate and PB can bring. Aside from the fact that this combo more closely resembles peanut butter cups than what you can buy at stores, they also bring on the benefits. You’re getting some iron from those dark chocolate chips, fiber and antioxidants from the dates, and protein from the peanut butter. So the next time you’re looking to satisfy your peanut butter cup cravings, you know exactly where to look. Try these six healthy snacks inspired by your favorite not-so-healthy foods. And take a look at three mouth-watering recipes with genius healthy food swaps even the pickiest eaters will love.